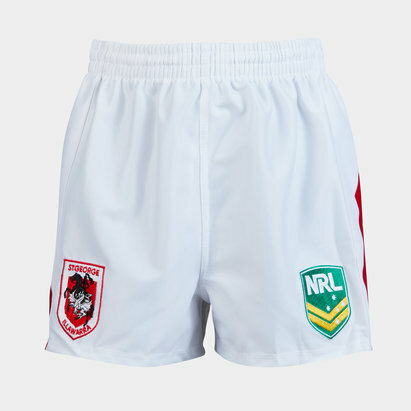 Go crazy for the Saints when you pull on these St George Illawarra Dragons NRL Supporters Rugby Shorts from ISC. The team colours of the St. George Illawarra Dragons are red and white, colours shared by both the St. George Dragons and Illawarra Steelers. The club name Dragons is a shortened version of "Dragonslayers", the original nickname of St George. These shorts stick to tradition and are predominantly red with white detailing down the sides. The NRL logo is on the left with the club badge on the right.